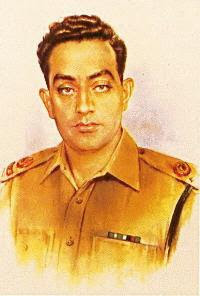 Raja Aziz Bhatti was born in 1928 in Hong Kong. He belonged to a Ladian; village of Tehsil Kharian, District Gujrat (Pakistan). He joined Punjab Regiment of Pakistan Army as Commissioned Officer. He was serving as Company Commander in Burki Area of Lahore Sector during 1965's Indo-Pak War. He defended BRB canal with his platoon from Indian Troops for 5 days. Major Aziz Bhatti was martyred on 10 September, 1965. Government of Pakistan awarded him highest military award Nishan-e-Haider. He is burried at his village Ladiyan, Gujrat. A day before his death, his Commanding Officer advised him to take a little rest while another officer will replace him during this time. Major Aziz Bhatti replied, "I don't want to go back. I will shed last drop of my blood in the defence of Pakistan". DHQ Hospital Gujrat was renamed after him as Aziz Bhatti Shaheed Hospital Gujrat. This hospital is now got the status of Teaching Hospital of NSMC, UOG. Several other places, roads and centres was named after him to pay tribute to this brave man. Raja Aziz Bhatti belongs to Rajput Bhatti Family. Liaqat Ali Khan, First Prime Minister of Pakistan awarded him Sword of Honour and Norman Award.